How much ice cream was in your bowl last time you had some? Take a look at the photo on the left. 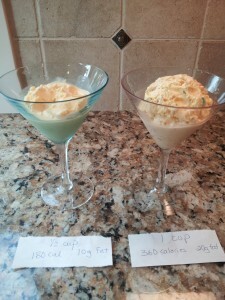 The left cup depicts a half cup portion of Tillamook Cake Batter Ice cream. 180 calories and 10 grams of fat. But I’d bet most people have more like one cup…or more…like in the cup on the right. That will set you back 360 calories and 20 grams of fat. That’s half the amount of total fat someone who eats 1500 calories a day should have. And it’s 9 more grams of ”bad” saturated fat than someone eating 1500 calories should have in one day. 1. Buy the LIGHT version instead of the full fat version. Dreyer’s makes some wonderful “slow churned” light ice creams such as their French Vanilla that contain 100 calories and 4 grams of fat. That will save 80 calories per half cup or 160 calories per cup portion. Think saving 80-160 calories doesn’t pay off? 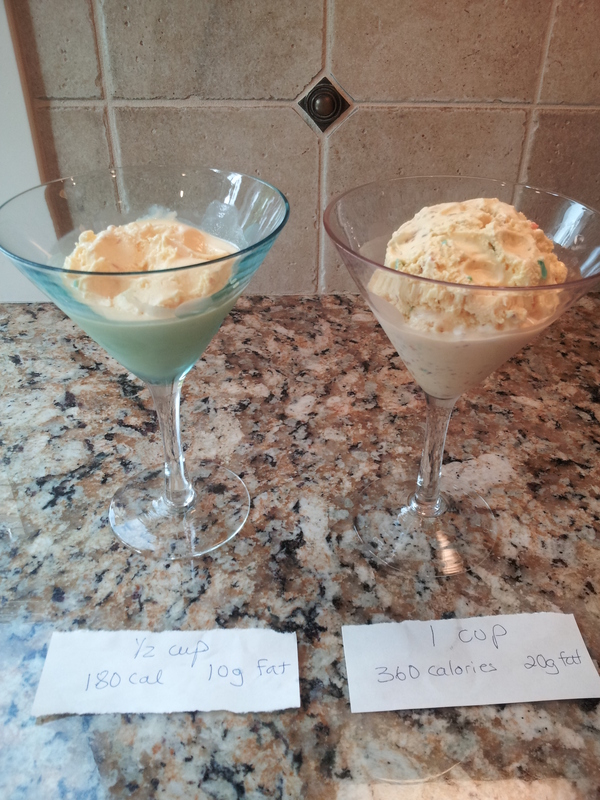 If you need 1500 calories a day to maintain your current weight and you add just a little more ice cream daily (or anything else additional to the tune of 80 calories) you will gain a pound in 43 days and eaten every day that will lead to a 8.5 pound weight gain in a year. 160 additional calories will create a one pound weight gain in 22 and a 16.5 pound gain in a year. So every little method we can save on some calories adds up. 2. Measure the ice cream. I know your secret…you take a spoonful taste for yourself, and then one scoop goes in the bowl, then one for you, then one for the bowl….those calories add up, you know. 3. And the last tip (because I know you like to have a decent sized portion): instead of a big 1 cup serving of calorie and fat laden ice cream top a half cup portion of ice cream with a half a cup of fruit. Adding half cup of raspberries added only 32 calories. 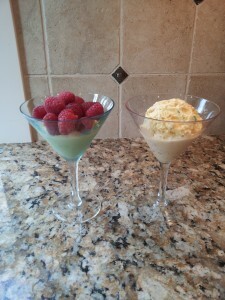 Look at the photo of the half cup ice cream with the antioxidant rich raspberries on top. With the full fat ice cream that is 212 calories. If I had used light vanilla it would be 132 calories and 4 grams of fat. That’s quite a savings compared to the original one cup portion of full fat ice cream for 360 calories and 20 grams of fat. 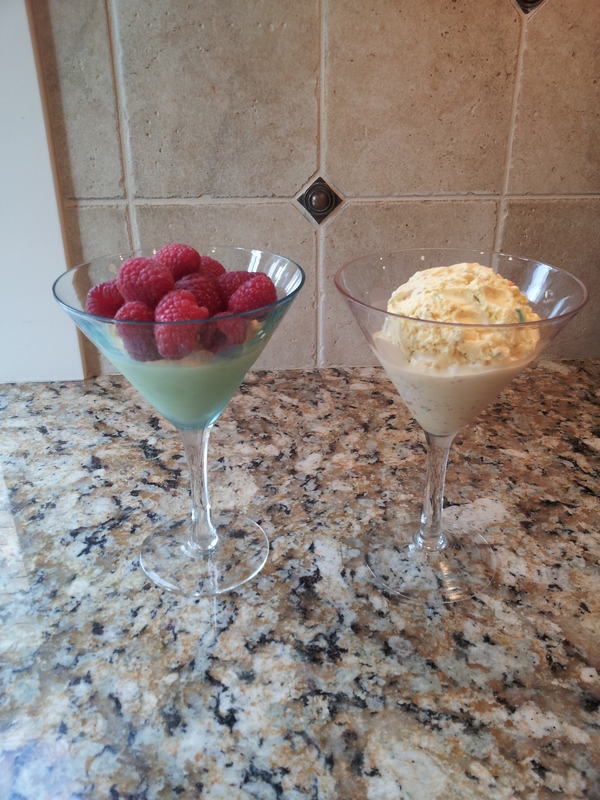 And look how big the ice cream/raspberry portion is. Try this next time you have some ice cream. You really can have your ice cream and eat it too! There are 29 cuts of beef that meet the labeling guidelines for lean. All of these have a fat content of these cuts of meat falls between chicken breast and chicken thigh when comparing cooked 3 ounce servings. Guidelines state that a serving is “extra lean” if it has less than 5g total fat, 2g or less saturated fat and less than 95mg cholesterol per 3.5 oz. serving. A serving qualifies as “lean” if it has less than 10g total fat, 4.5g or less saturated fat and less than 95mg cholesterol per 3.5 oz. serving. Print out the list and put it in your wallet to help you select the leanest cuts of meat. Here are the healthiest cuts, listed in order of least to most fat content. Have you noticed that food portions have gotten larger? Some portions provide enough food for at least two people. With this growth have come increases in waistlines and body weight.To see if you know how today’s portions compare to the portions available 20 years ago, quiz yourself on Portion Distortion I and Portion Distortion II. You will also learn about the amount of physical activity required to burn off the extra calories provided by today’s portions. I hope you find Portion Distortion insightful and fun. I also hope that next time you eat on the run, you will think twice about the food portions offered to you.